Psi Gate offers merchant accounts, online payment gateway services, and e terminal support for online credit card processing. With the normal attention to fraud protection and security concerns for credit card transaction protection, PSI Gate offers services for your business whether it is a small business from home or you run a large company. 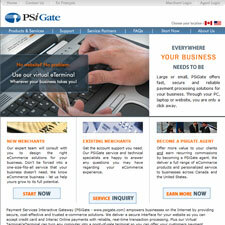 PSI offers a one stop service solution from merchant account to online sales transaction processing. My review thus far is only based on their service as I have been “trying” to apply but can’t even get someone from there to get back in touch with me. If their service is as good as their support, I’ll pass on this one. Not impressed.